For use in lawns, gardens, flower beds and around the home. Do not use on pasture land. Safest material ever developed for control of Japanese Beetles. Agway Grub Contro. 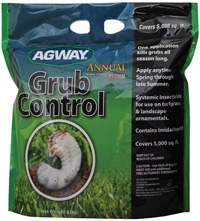 One annual application is all it takes to control grubs all season long. New High-Efficiency Formulation 50% higher concentration 33% less weight. Same great coverage, excellent turf rescue formula - stops active Grub damage overnight. PLUS kills Sod Webworms, Cutworms, Mole Crickets, Ants, Chinch Bugs, Crickets, Ticks,Billbugs, Earwigs, Grasshoppers, Leafhoppers, Millipedes, Pill bugs, and Sow bugs. Bayer Active: 9.3% DYLOX (trichlorfon). New Lighter Weight Sizes: 20 lb. treats up to 15,000 sq. ft. Not for sale in ME. New High Efficiency Formulation 50% higher concentration 33% less weight. Same great coverage, excellent turf rescue formula - stops active Grub damage overnight. 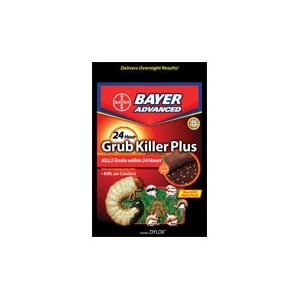 PLUS kills Sod Webworms, Cutworms, Mole Crickets, Ants, Chinch Bugs, Crickets, Ticks, Billbugs, Earwigs, Grasshoppers, Leafhoppers, Millipedes, Pill bugs, and Sow bugs. Bayer Active: 9.3% DYLOX (trichlorfon). Not for sale in ME. 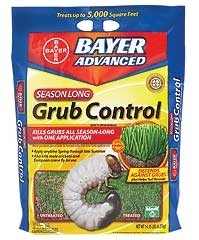 Bayer Advanced Season Long Grub Control with Merit. 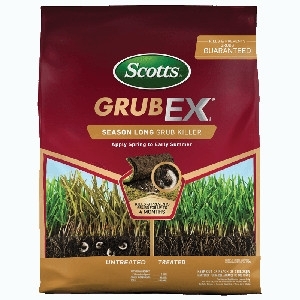 New formulation 0.25% Merit with fertilizer kills grubs for up to 4 months and helps turf recover from grub damage quickly. Guaranteed! Not for sale in Long Island, NY. 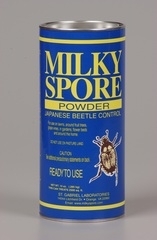 Milky Spore begins working as soon as it is applied as long as grubs are feeding. 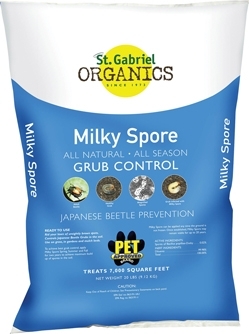 Once grubs are infected they will multiply the spore by several billion times and spread it further. In warm climates good control can occur in one to three years, and in colder areas like New England, three to five years. 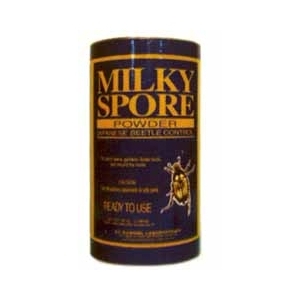 Once established in a lawn, Milky Spore has been known to last 15 to 20 years. Restricted in the following states: LA. 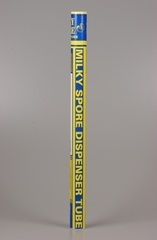 Each dispenser holds up to 2.5 pounds of spore powder enough to treat up to a quarter acre before refilling. May be used for dispensing other garden dusts. Works by shaking dispenser when walking the area being treated. Adjustable slider port allows for rate control when powder is affected by high or low humidity. One application kills and prevents all season (4 months) - guaranteed! 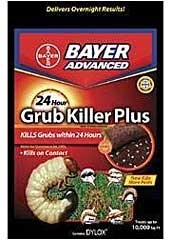 Kills 25% more grub types. Improved killing power with 60% less active ingredient. Not for sale in NY.